Wellington Street on Canada Day. Wellington's prime location ensures its closure for many public holidays. Wellington Street (French: Rue Wellington) is a major street in Ottawa, Ottawa, Canada. The street is notable for being the main street of the Parliamentary Precinct of the Parliament of Canada. It is one of the first two streets laid out in Bytown in 1826 (the other being the eastern leg of Wellington, Rideau Street). The street runs from Booth Street to the Rideau Canal where it connects with Rideau Street and delimits the northern border of the downtown core. 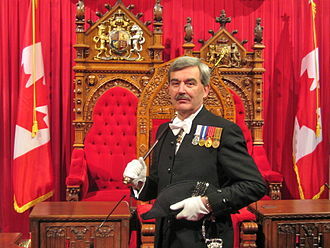 It is named after the Duke of Wellington, in recognition of his role in the creation of the Rideau Canal, and therefore of Ottawa (see History of Ottawa). Starting at its easternmost point, Wellington forms the northern edge of Confederation Square, south of which runs Elgin Street. West of Confederation Square, Parliament Hill can be found on its north side, while the Langevin Block, home of the Prime Minister's Office and of the Privy Council Office, the former American embassy and the Wellington Building can be found to the south. West of the intersection with Bank Street, are located the Confederation Building and the Justice Building (still considered within the Parliamentary Precinct), while the headquarters of the Bank of Canada can be found opposite the Hill. 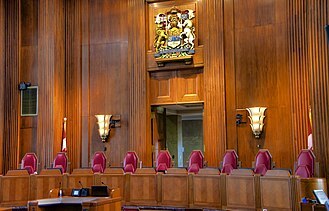 Beyond Parliament Hill, the Supreme Court of Canada is situated west of the Justice building, and opposite St. Andrew's Presbyterian Church. The East and West Memorial Buildings can be seen next, respectively standing east and west of Lyon Street and linked by the Memorial Arch. West of the Supreme Court is the National Library and Archives of Canada main building, with the Garden of the Provinces across the street. Between the Supreme Court and the National Library is a large open area that is today a mix of parkland and large parking lots. Until the 1970s, this was home to a cluster of temporary buildings that had been erected in the Second World War to provide much-needed office space. In the 1970s, there was a plan to build both a home for the Federal Court and the National Gallery. A design competition was even held for the National Gallery, but in the end, the government cancelled both projects. Wellington Street continues west past the Portage Bridge, north of the eastern half of the Lebreton Flats, and becomes the Sir John A. Macdonald Parkway after crossing Booth Street at the Canadian War Museum. West of the O-Train Bayview station, a separate segment (originally an extension of the same street) is known as Wellington Street West, and passes through the Hintonburg and Island Park neighbourhoods before becoming Richmond Road at Island Park Drive. Both sections of Wellington are four-lane historic urban arterial roads with a speed limit of 50 km/h (30 mph), although the flow is generally even slower than that due to high pedestrian traffic. 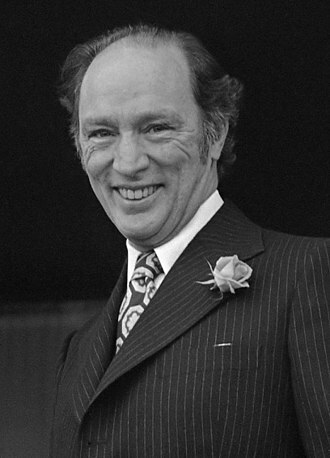 A number of proposals have been made to change the street's name (to honour Sir John A. Macdonald or Pierre E. Trudeau, for example), some as recent as 2010. From Bronson Avenue until Rideau Street, Wellington is also known as Ottawa Road #34. From Western Avenue to Somerset Street, Wellington is known as Ottawa Road #36. Wellington Street from Bay Street to the Rideau Canal showing the prominent structures located along it. See Downtown Ottawa for a map of the entire area. ^ "Historian wants Wellington Street renamed". CBC News. May 10, 2010. Retrieved December 27, 2018. 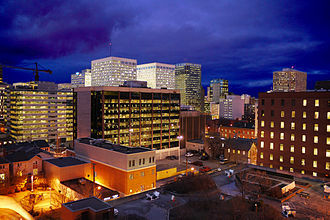 Bytown is the former name of Ottawa, Canadas capital city. It was founded on September 26,1826, incorporated as a town on January 1,1850, the founding was marked by a sod turning, and a letter from Governor General Dalhousie which authorized Lieutenant Colonel John By to divide up the town into lots. Bytown came about as a result of the construction of the Rideau Canal, Bytowns first mayor was John Scott, elected in 1847. Bytown was located where the Rideau Canal meets the Ottawa River, Upper Town, situated to the west of the canal, was situated in the area of the current downtown and Parliament Hill. Lower Town was on the east side of the canal where todays Byward Market, the two areas of town were connected over the Rideau Canal by the Sappers Bridge, constructed in 1827. The town took its name from John By who, as a Colonel in the British Royal Engineers, was instrumental in the construction of the canal. 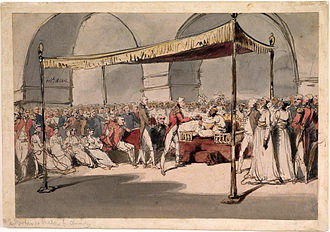 The name Bytown came about, somewhat as a reference during a small dinner party of some officers. The number of houses now built is about 150, most of which are constructed of wood, frequently in a style of neatness, Colonel By laid out the streets of Bytown, a pattern that mostly exists today. Wellington Street, Rideau Street and Sparks Street were some of the earliest streets in use, Sappers Bridge actually connected Sparks Street to Rideau Street at that time. Nicholas Sparks owned Bytowns land west of the canal, except for the north of Wellington. The area east of Bank Street to the canal was acquired by the military, Bytown had seen some trouble in the early days, first with the Shiners War in 1835 to 1845, and the Stony Monday Riot in 1849. Some early buildings still stand had been erected in Bytown. In 1826, Thomas McKay was contracted to build the commesariat building, McKay built Rideau Hall, and parts of the Union Bridge connecting LeBreton Flats to Hull. Notre-Dame Cathedral Basilica was early on in the developing town. 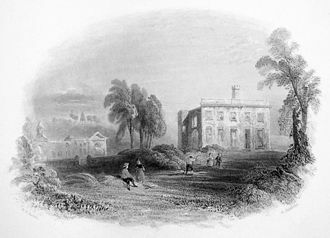 The University of Ottawa had its 1846 origins as a college, though administration of Bytown had been conducted by civil authorities since 1828, the town did not become incorporated until much later. Somerset Street is a street in Ottawa, Canada. It is divided into Somerset Street East and Somerset Street West by the Rideau Canal, Somerset Street East is a short road that runs through the neighbourhood of Sandy Hill from the University of Ottawa campus to the west and Strathcona Park to the east. Somerset used to extend east over the Rideau River towards St. Laurent Boulevard, that bridge was demolished, and the street was renamed to Donald Street east of the river. Also known as Ottawa Road #36, Somerset Street West begins at the Queen Elizabeth Driveway in the east, Somerset Street West houses the backbone of Ottawas Chinatown, between Bay Street in the east to Preston Street in the west, which is the centre of Ottawas Little Italy. The area of the street between Bank and OConnor is known as Somerset Village, in the 1870s, as the area was developed, a bridge was proposed linking the two Somerset Streets over the Rideau Canal. However, this never came into existence. The street continues through the campus as Marie Curie Private, with traffic restricted to bicycles in the westbound direction, the Corktown Footbridge connects the two sides, but is restricted to non-motorized traffic. 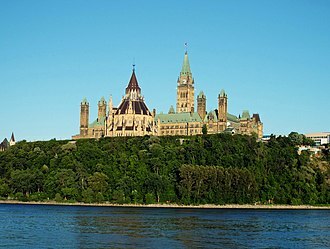 In Canada, the Office of the Prime Minister, located in the Langevin Block, facing Parliament Hill, in Ottawa, is one of the most powerful parts of the government. It is made up of the minister and his or her top political staff. It should not be confused with the Privy Council Office, which is the top office that controls the service and is expressly non-partisan. The PMO is concerned with making policy whereas the PCO is concerned with executing the policy decisions decided by the government and this is because, unlike those examples, the Canadian Prime Ministers official residence is not the site of any bureaucratic functions. They act as a link between the party organization and the government. 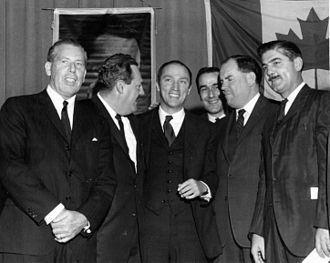 After that point, the PMO became more central to the government, after Jean Chrétien was appointed as prime minister, the PMO continued to be the central organ of the government. 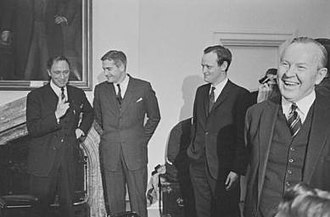 Chrétiens successor, Paul Martin, changed the structure of the PMO to more match that of the Executive Office of the President of the United States, Martin further, and significantly, increased the salary of the PMOs staff. J. E.
Confederation Square is an urban square in Ottawa, Canada, and is considered the second most important ceremonial centre in Canadas capital city, after Parliament Hill. The square was designated a National Historic Site of Canada in 1984, part of the square crosses over the Rideau Canal, itself a National Historic Site of Canada and a World Heritage Site. A triangular plaza once located approximately at the site of todays Confederation Square was named after Governor General Connaught and this work was finished by December 1912 and the location was named Connaught Place on March 24,1913. Two prime ministers had promoted the beautification of the city, Wilfrid Laurier from 1896-1911. By 1927, a commission for improvements named the Federal District Commission was formed out of an effort called the Ottawa Improvement Commission. King invited French architect Jacques Gréber to help with the design for a square which would include a war memorial, the area at this time had five notable structures, most which have been standing for decades. King had plans involving widening Elgin Street even by 1927, with hopes of bringing emphasis to the Parliament Hill, the hotel was destroyed by fire on April 14,1928. The Russell Theatre, which was burnt on that date got expropriated for demolition in order to bring about these plans. The Federal District Commission expropriated the hotels site, the church was expropriated November 20,1930. 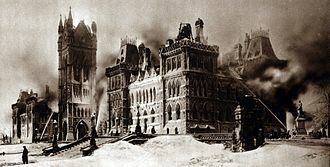 City Hall burned down March 31,1931, in 1937, Greber visited Ottawa but disagreed with King on the placement of the war memorial, for fear of traffic problems. Ottawas former Central Post Office had been constructed in 1876, the old post office was demolished in June 1938 in order to build the square. Knox Presbyterian Church had been demolished on June 1938, the Royal Bank of Canada building at the northwest corner of Elgin and Sparks had been removed. By October, the War Memorial had been erected and the Plaza Bridge had been widened, work was underway for the building of the new Central Post Office. Elgin Street was widened in April 1939. Island Park Drive is a short, but important and scenic, north-south street in Ottawa, Canada. It is one of several parkways in Ottawa administered by the National Capital Commission providing scenic routes throughout Canadas capital region and this street is lined with luxury homes and several embassies. 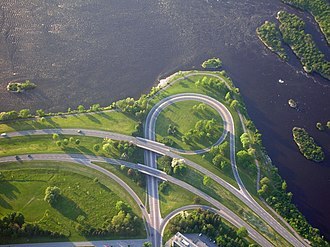 The north end links up with the Sir John A. Macdonald Parkway and the Champlain Bridge, the road is named for Bate Island, the largest island crossed by the Champlain Bridge, which has a small park with road access. The south end leads to the Central Experimental Farm, where it turns into the NCC Driveway, Island Park Drive has a northbound offramp from the westbound Queensway and no other ramps. Hampton Park is north of the Queensway and borders Island Park Drive and other Island Park residents can frequently be seen in the park walking their dogs. During the summer of 2007, the Highway 417 overpass was replaced using a replacement technology technique which uses heavy lift. This involved lifting out the old bridges and replacing them with new bridges that were built nearby and it was the first of two similar operations in the 417 corridors, the other being at a future date near the Carling Avenue area. By 1914, Ottawas population had surpassed 100,000 and today it is the capital of a G7 country whose metropolitan population exceeds one million. The origin of the name Ottawa is derived from the Algonquin word adawe, the word refers to the Indigenous Peoples who used the river to trade, fish, harvest plants and for other traditional uses. The first maps made of the area started to name the river after these peoples. 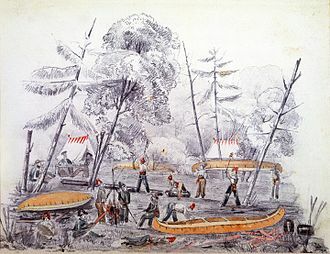 For centuries, Algonquin people have portaged through the waterways of both the Ottawa River and the Rideau River while passing through the area. French explorer Étienne Brûlé was credited as the first European to see the Chaudière Falls in 1610, no permanent settlement occurred in the area until 1800 when Philemon Wright founded his village near the falls, on the north shore of the Ottawa River. Lt. 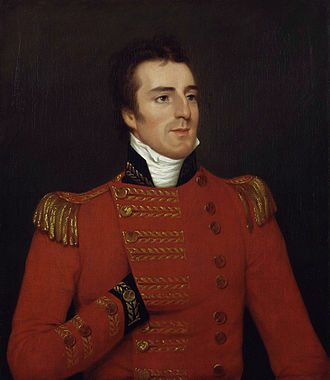 Colonel John By was an officer of the Royal Engineers commissioned by the British Government in 1826 to superintend the construction of the Rideau Canal. The founding was marked by a sod turning, and a letter from Dalhousie which authorized Colonel By to divide up the town into lots. 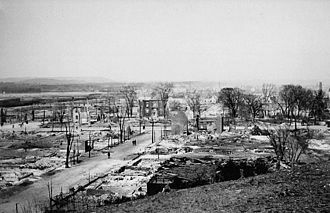 The town developed into a site for the timber, and sawed lumber trade, causing growth so that in 1854, Bytown was created a city and its present more appropriate name, Ottawa was conferred. 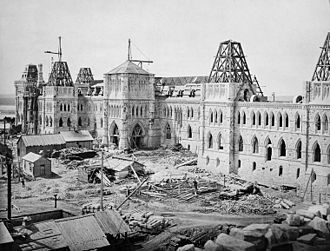 Shortly afterward, Queen Victoria chose Ottawa as the capital of Canada, at this time, increased export sales led it to connect by rail to facilitate shipment to markets especially in the United States. In the early 1900s the lumber industry waned as both supply and demand lessened, growth continued in the 20th century, and by the 1960s, the Greber Plan transformed the capitals appearance and removed much of the old industrial infrastructure. 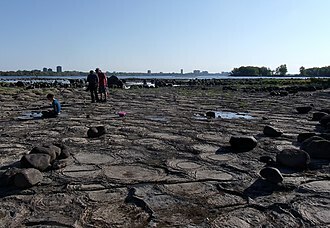 In 2001, the city amalgamated all areas in the former region, with the draining of the Champlain Sea around 10,000 years ago the Ottawa Valley became habitable. The Algonquin people who called the Ottawa River the Kichi Sibi or Kichissippi meaning Great River or Grand River maintained a route along the Ottawa River for a relatively short time. The word Ottawa is in relation to the Ottawa people, the First Nation who hunted, camped and traveled in the area, and lived far to the west along Georgian Bay and Lake Huron. 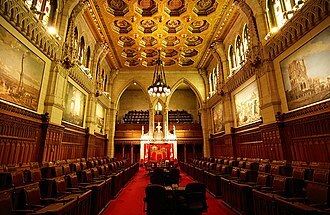 The Confederation Building is a gothic revival office building designed by Richard Cotsman Wright and Thomas W. Fuller in Ottawa, Canada. Located just west of the Parliament Buildings at Bank and Wellington Streets, the land where the Confederation Building and the Supreme Court of Canada now stand contained homes and businesses. These were expropriated by the government to allow for the construction of new federal buildings, work on the Confederation Building began when the cornerstone was laid by the Governor General on July 1,1927 as part of the celebrations of Canadas Diamond Jubilee and it opened during 1931. It originally housed workers in a number of departments, with the Department of Agriculture being the largest tenant, today it is home both to civil servants and to a number of MPs and ministers. Many Conservative, Liberal and NDP MPs have their offices there along with some junior cabinet members, as part of the ongoing work on Parliament Hill there are currently discussions to fill the space between the Confederation Building and the smaller Justice Building to create more office space. Rideau Street is home to the Château Laurier, the CF Rideau Centre and the Government Conference Centre. 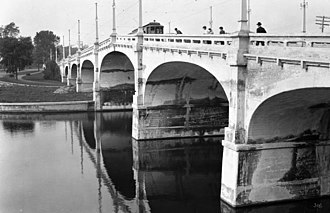 Along with Wellington Street and Sussex Drive it was among the first streets in Ottawa to be host to businesses, the Plaza Bridge by the Rideau Canal is at its westmost point and the Cummings Bridge is at its eastmost point. For many years, Rideau Street was one of Ottawas primary retail thoroughfares, containing department stores such as Freimans, Woolworth, Caplans, in November 1979, mayor Marion Dewar examined a plan to create what became the Rideau Street Bus Mall. Sidewalks from Sussex to Dalhousie were enclosed in a continuous glass-and-steel structure, the heated mall was expected to allow pedestrians to shop in comfort year-round. However, the structure had an unanticipated down side, in that it attracted large numbers of homeless, many establishments along the affected stretch of Rideau Street failed as a result. The decision was made to tear the shelters down, and in the end the cost for dismantling them was almost as much as the $6.5 million incurred in their construction. The East Memorial Building and West Memorial Building are a pair of government buildings in Ottawa, Canada. Construction started in 1949 to house the rapidly growing Department of Veterans Affairs, the buildings were thus originally named the Veterans Memorial Buildings. They were designed by George Roper Gouinlock and H. L. Allward, the National Capital Commission in collaboration with Public Works and Government Services Canada erected a historical plaque and West Memorial Buildings - For those who served. In the 1950s, Canada erected the twin Memorial Buildings on Wellington Street, one of those buildings, at the time housed the new Department of Veterans Affairs. In the 20 century alone, nearly two million Canadians served their country in war, now Canada serves these people through the Veterans Charter, a pact exceptional in the world for the breadth and scope of services it offers. The answer was a brilliant array of educational, housing, honouring a generation - The memorial Buildings, erected in 1949 and 1955 respectively, were designed with a sleek melding of neoclassical and copper-roofed chateau styles. The buildings are unusual in that they are linked by the memorial Arch, which is not really an arch at all, the Memorial Arch is dedicated to all who served in the Second World War. A feat of arms - In April 1945, Canadian troops crossed the Rhine, as Canadian tanks rolled into one Dutch town after another, the people went wild with joy and took to the streets in celebration. Returning to Canada, those who served from 1939 to 1945 were honoured with the title of veterans, the Canadian government helped thousands of veterans like Stanley Lolley- a survivor of two World Wars- to get an education or establish businesses. Edward Dunlop of the Queens Own Rifles was blinded in 1943 while saving others from a grenade explosion and he was active in the rehabilitation of disabled veterans and was awarded the Order of the British Empire for that work. A memorial is dedicated to the memory of 1701 Men of the Canadian Bank of Commerce who served in the Great War, the buildings are located on the south side of Wellington Street, across the street from the Supreme Court of Canada Building. Elgin Street is a street in the Downtown core of Ottawa, Canada. Originally named Biddys Lane, it was named after Lord Elgin. The north/south running street begins at Wellington Street in Confederation Square, just east of the Parliament buildings, in the centre of Elgin Street for the first two blocks is Confederation Square, home of Canadas National War Memorial. To the south of this on the east of Elgin is the National Arts Centre, continuing south, Elgin is fronted by Confederation Park to the east and the Lord Elgin Hotel to the west. South of the park, just past Laurier Avenue, is the Ottawa Court House, across from the First Baptist Church and Grant house, followed by City Hall and Knox Presbyterian Church. South of this, the street becomes mainly an area, home to a number of stores, restaurants. 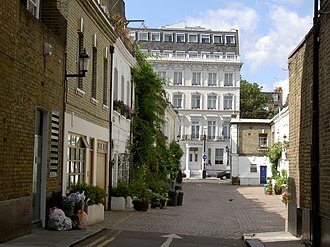 Progressing south, the street becomes more residential, home to low rise apartment buildings. Elgin ends at the Queensway, where it turns into Hawthorne Avenue before turning east, at the southern end of Elgin is the headquarters of the Ottawa Police Service. 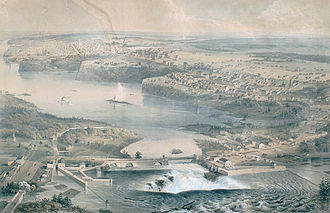 The Chaudière Falls and Chaudière Island in 1838 before damming. Downtown Ottawa is dominated by government buildings such as Parliament Hill (left) and Langevin Block (right). St. Andrew's Presbyterian Church is one of several churches located in Downtown Ottawa. Sparks Street is a pedestrian mall in Downtown Ottawa, closed off to vehicle traffic. Two children in LeBreton Flats in 1963, as the lands were being expropriated and the residents forced to vacate the neighbourhood. View of LeBreton Flats in December 2005, prior to redevelopment. View of Bronson Ave. looking north from Gilmour St.
View of Bronson Avenue from Somerset Street looking northward. View of Bronson Avenue looking south from McLeod. Bike path beside the Parkway. Trillium Line crossing Rideau River. Bayview's platform is at the northern terminus of the original line. Island Park Drive, then known as Western Drive, in the 1920s. 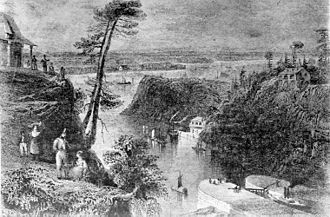 Entrance of the Rideau Canal in 1839. In 1826, eight locks were constructed by the Royal Engineers with labour from Irish and French settlers. The building in the foreground is today called the Bytown Museum. On the right is Parliament Hill at the time named "Barrack Hill". Wellington St. West in Hintonburg. Booth Street, looking north at Gladstone Avenue.